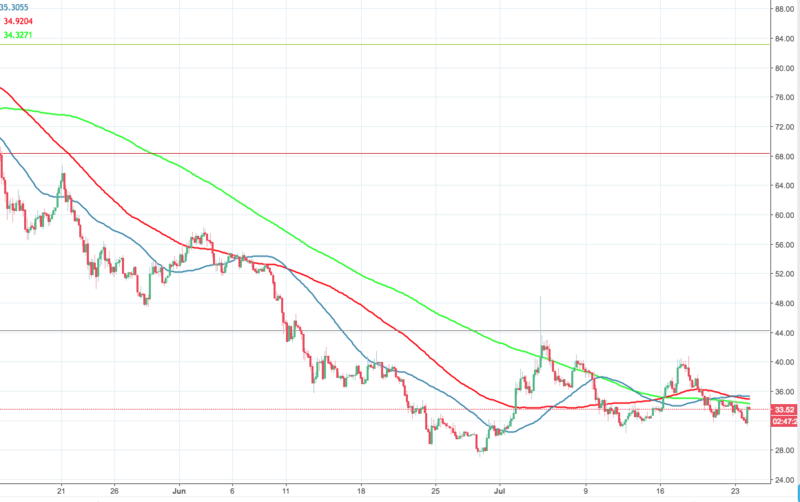 NEO/USD price is capped by 50-DMA.Critical support is created by $30.00. NEO price analysis cover the latest trend in the price of NEO. The 13th largest coin, is trading at $33.80 at the time of writing with the long-term downside bias. The coin is unchanged on a daily basis, but 4.6% higher for the past 48 hours. NEO is Chinese adopted digital currency also knows as “Chinese Ethereum” has a market value of $2.1B and an average trading daily volume at $95M. NEO/USD recovery of $34.10 proved to be short-lived as the coin is capped by 200-SMA (4-hour chart). Fresh selling interest located on approach to this level, pushed the price lower, mitigating positive momentum. On a daily chart, NEO stays under 50-DMA, which effectively caps the upside since May 12 and creates a long-term sloping trendline. A sustainable movement higher is needed to break the bearish sentiment and bring $40.00 into focus. Once this area is cleared, the upside may be extended towards $44.27 (previous low of 2018). However, on the downside, the support comes at $31 (Asian low). Once it is cleared, the downside may be extended towards the critical $30.00 and $25.00 as the support base. That’s where new buyers are likely to appear and trigger the recovery.